Today is Priscilla and my five year wedding anniversary, and I want to share a fun story about how it came together. Yesterday was the five year anniversary of Facebook's IPO. Now you may ask, who would plan their wedding for the day after their IPO? Good question. Priscilla and I wanted a low key wedding so we decided to make it a surprise and have it in our backyard. I sent our friends and family an email telling them I was throwing a surprise party for Priscilla to celebrate her graduation from medical school. Since they thought it was a surprise for Priscilla, they kept it quiet. When they showed up at our home, I told them we were getting married. It was a great day. 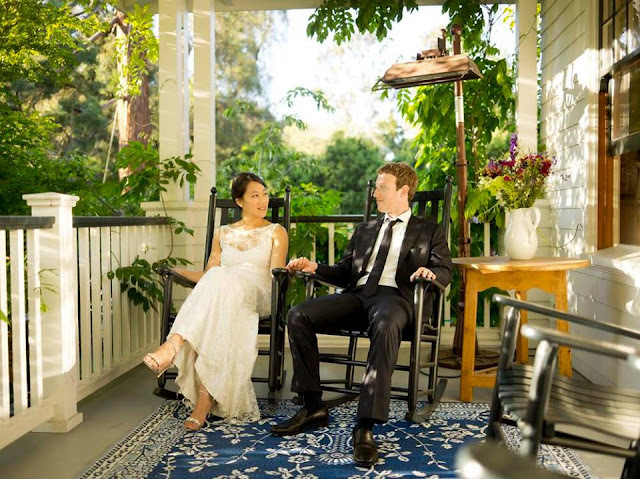 One side effect of having a surprise wedding is that Facebook's CFO who was managing our IPO process had no idea we were getting married. With IPOs, the process goes on for a while and you just go public when everything is ready. When I originally set the date for our surprise, we had no idea when the IPO would be. I remember the day David, our CFO, told me the IPO process would conclude on May 18. I was shocked. I closed the door and asked if it was possible to maybe do it a few days sooner. He said it wouldn't be ready yet. I asked if maybe we could do it a week later, and he told me that May 18 was the day it would be ready so it needed to be that day. And that's how our IPO came to be the day before our wedding. The wedding was really special, but, as you know, our IPO wasn't exactly smooth. Priscilla and I took off on our honeymoon, but I wanted to be with our team when things got rocky, so I cut our honeymoon a few days short. Instead, I promised Priscilla that every year we'd have a honeymoon to celebrate our marriage. That brings us to today. Some years we've gone to Japan or France. This year we're traveling around the US and we'll be spending our honeymoon in rural Maine. One lesson I've learned from marriage is that exploring together just gets better over time. Priscilla, here's to a great sixth year of marriage and perhaps some better planning in the future!